My artistic friend Chris has just published his first stop-motion blue tack creation. It rocks. Watch it on youtube immediately. At the end of last week, myself and five other 3rd years represented the University of Manchester at the IBM University Team Challenge. We competed against 16 other UK universities at IBM’s site in Hursley (near Southampton). After a meal the previous evening and various introductions we were given 2 hours 30 minutes to complete as many challenges as we could. There were 24 challenges, grouped by category: maths, logic, communication, sensory, mystery, physical. In one challenge, 5 of us had to communicate a map to our team mate who had to transcribe it, but our communication was limited to 4 picture cards, 4 smells, and a rattle (no talking allowed). 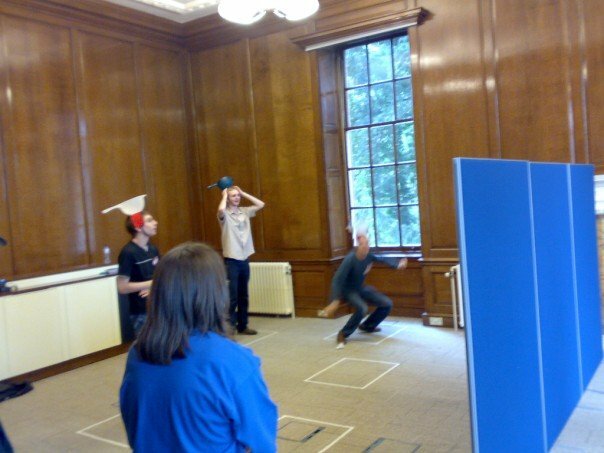 In this challenge we had to strap colanders to our heads and catch badminton shuttles in them, which were batted by a team mate from behind a wall! The second half of the competition was a quiz, with various dynamics to mix things up a bit. The winning team – Cambridge – won a ThinkPad each and £1000 for their university. As we didn’t come in the top 3 overall, we were not told our position, but we do know that we came 2nd in the first half of the competition with 7 challenges completed (plus a bonus for completing at least one challenge in each category).